Apply the chosen base color all over the nails. 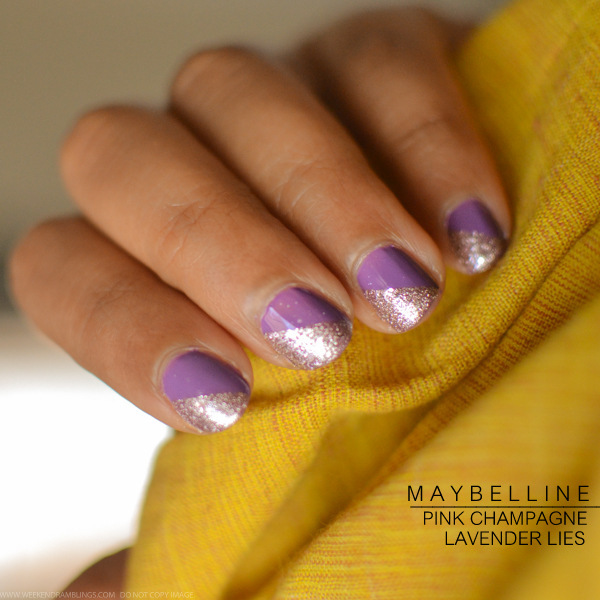 I have used a creamy lavender - Maybelline Lavender Lies - and applied 2 coats of this. Allow to dry. Once the polish is dry to touch, apply tape diagonally across the nail, covering the base of the nail and leaving a triangle exposed towards the tip of the nail. Things to remember with using tape - wait for the polish to dry completely and make sure the tape isn't too sticky or it just might pull off the base polish. I have some really old tape lying around which has next to no glue on it, but an easy way is to apply the tape on the back of the hand a couple of times to take off excess glue. Make sure the edges of the tape are completely sealed. 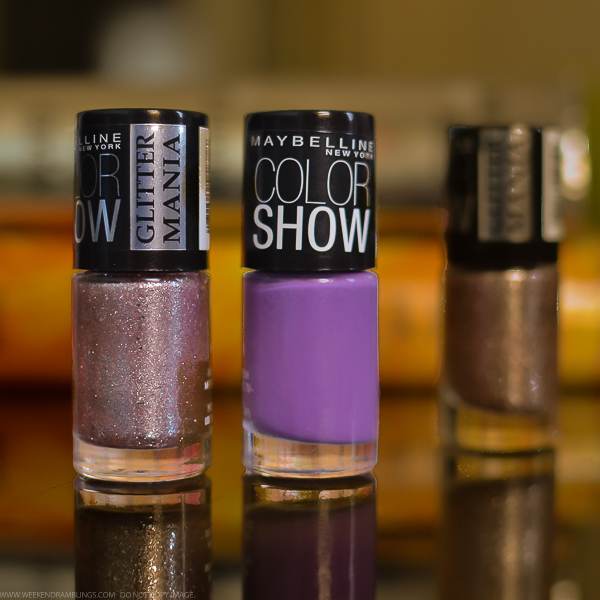 Then, apply the glittery shade - I have used Maybelline Giltter Mania Pink Champagne - over the exposed part of the nail. It's okay to be messy and get polish on the tape. Wait a bit so the polish dries and then carefully remove the tape. This part is easy with the Glitter Mania polish since it dries to touch quite fast and isn't too runny to start with anyway. Clean up any polish/glitter around the nail edges. 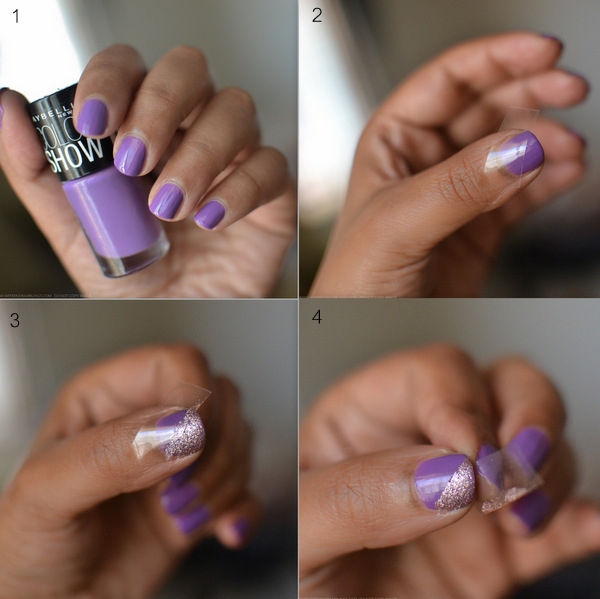 Finish with a clear top coat to ensure that the nail polish feels smooth to touch and also stays on longer. 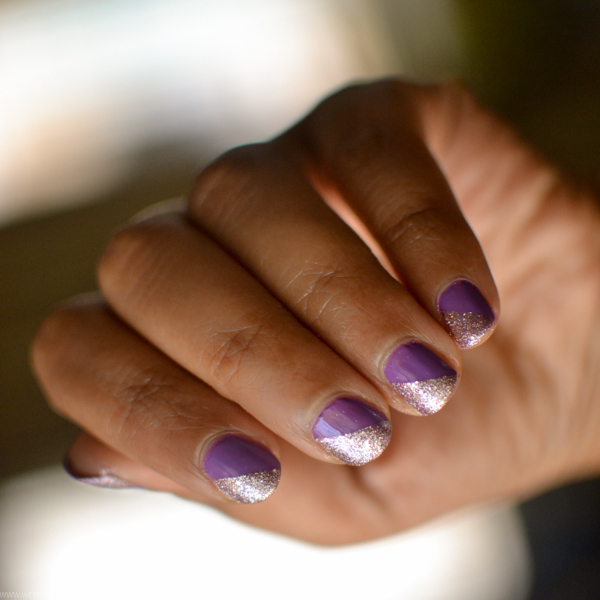 And that's the finished glitter-tape manicure. While glitter polishes look great as all-over nail colors, I love pairing them with other nail colors and using glitter as accent. It's a fun way to add some shimmer into an everyday outfit without looking too dressed up, imo. PS: Glitter is a bit pesky to get off the nails. I find that layering it over a base polish makes it easier to remove. Also, use an acetone-based polish remover and don't skimp on the cotton. NAIL POLISHES FEATURED IN THIS POST WERE PROVIDED FOR REVIEW.